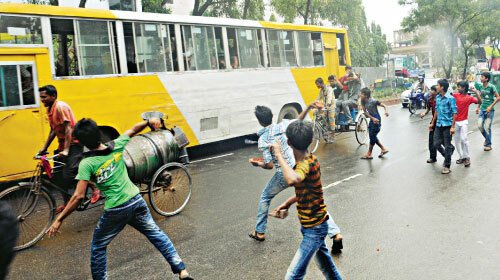 Dhaka, Bangladesh (BBN)- Several hundred workers of a garment factory at Palashbari of Ashulia, on the outskirts of the capital staged protests on Saturday against the termination of their co-workers a day after the factory reopened after a long workers’ unrest. Witnesses said the workers of Shahreer Garment became agitated after coming to know about the termination of 75 fellows. The protesters blocked the Nabinagar-Bipail road for an hour and vandalised at least five vehicles. They said that about 2,000 workers went to the factory in the morning to join work but began protesting after they saw a notice on the main gate declaring termination of 75 workers. Some other workers of the factory said they would continue their protest until the sacked workers were reappointed. The factory was shut amid workers’ protest. The workers said they would go for tougher agitation if their demands were not met. The deputy assistant director of Ashulia industrial police, Abdus Sattar, said the workers had left the factory and the situation was under control. Police reinforcement has been dispatched to avert trouble. Earlier on May 13, the BGMEA declared an indefinite closure of garment factories in Ashulia on security ground amid workers’ protests after the collapse of Rana Plaza at Savar on April 24 that left at least 1,127 people, mostly garment workers, dead and scores injured. The protests broke out on an eight-point demand, including wage increase, workplace safety and capital punishment for the owners of the collapsed Rana Plaza and the garment factories housed in the building. At a meeting at the secretariat in the capital Dhaka on Thursday, labour and employment minister Rajiuddin Ahmed Raju and home minister Muhiuddin Khan Alamgir assured factory owners of security at Ashulia. BGMEA president Atiqul Islam then announced reopening of the factories on Friday.